The Happy Business Plan. | Do. Be. Interesting. Home Adventure The Happy Business Plan. I had a lot to learn when I landed in Malta. Some things I refuse to accept, like the way that businesses cheat the government on VAT, or the way they pay their employees as little as possible, or the way that people here work non-stop to barely survive. It’s no wonder everyone here drinks like fish and chain-smokes from birth. It didn’t take long to figure out that that the sales from the Happy Hive kitchen would likely never be enough to offset the cost of employees and occupancy, as previous owners found out at this location. So the kitchen needed to be eliminated, but replaced by what? After all, we didn’t want to become solely a pub, even if that was profitable. And selling coffee during the day wasn’t going to pay the bills, especially with a large and well-established espresso venue with lots of outdoor seating downstairs. When BOOM Productions proposed the idea of having live music in the afternoons so as not to compete with their other venue having live music in the evenings, and I saw it work, the concept really clicked for me at a broader scope. The Happy Hive needed to cooperate, not compete, with its neighbors. 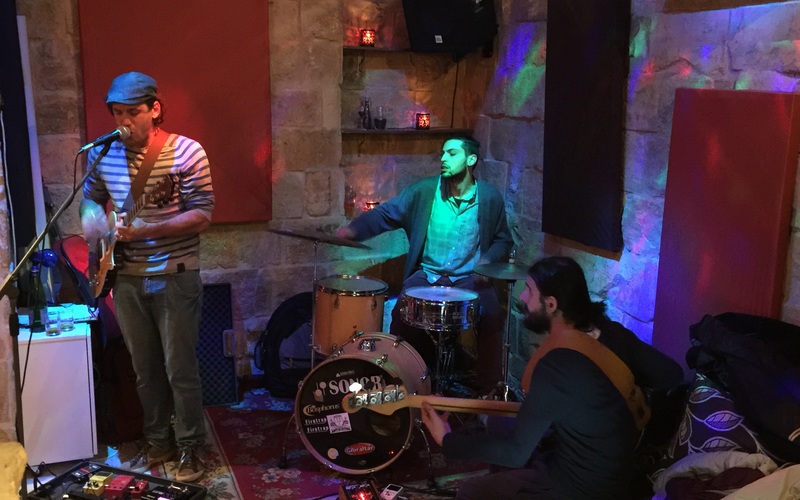 The one thing we do that no venue does well in the area, and arguably the entire island of Malta, is live music. I don’t mean the uninspiring background music that people largely ignore while they stuff their gaping pie-holes. There’s plenty of that here. I mean creative, authentic, passionate and original music that people go out of their way to pay for and see and experience with other music-loving fans. By providing a real live music venue, the Happy Hive would bring more business to everyone in the area. I imagine people coming to Marsaskala to enjoy the parks and beach, have dinner at one of the many restaurants in the area, and then enjoy live music and drinks at the Happy Hive. Malta desperately needs this scene. I have met a number of musicians and bands who are looking for a venue where their music is truly appreciated. And I have met a number of guests who come from distances for their love of live music. This was all converging toward a plan where the Happy Hive provides artists with a venue for their music and an opportunity for them to be compensated with either donations or a door charge, and the Happy Hive serves drinks and ready-to-serve small bites to our music-loving guests to pay the bills. The artists benefit from having a venue dedicated to music. The more serious they are about their music and their marketing, the more fans they accumulate, and the more success they have with the donations or door charge. Artists that have no fans and no motivation from working for the typical fixed fee in Malta are self-eliminated, because they make no money and have no reason to play at the venue. The Happy Hive benefits from marketing the bands because more fans means more business at the bar. And the venue doesn’t suffer when a band doesn’t bring any fans, since there is no guaranteed fixed payout to the band. The venue becomes a destination known for a happening music scene, which in turn provides the bands with more fans and more incentive to play at a well-known venue. And it only requires two or three staff to operate, which makes it financially viable. See how everyone cooperates, rather than competes, to create a vibrant and healthy system? Most of the Maltese people I’ve discussed this with tell me this plan won’t work, but I believe that’s because they have a myopic view of how things have always worked on this island and it’s difficult for them to imagine anything new. This weekend was the first weekend we were going to run with this new model and sadly, we were forced to close for unrelated reasons. So I’ll never get to know for certain who was right. Next articleFrom Dust I Will Return.